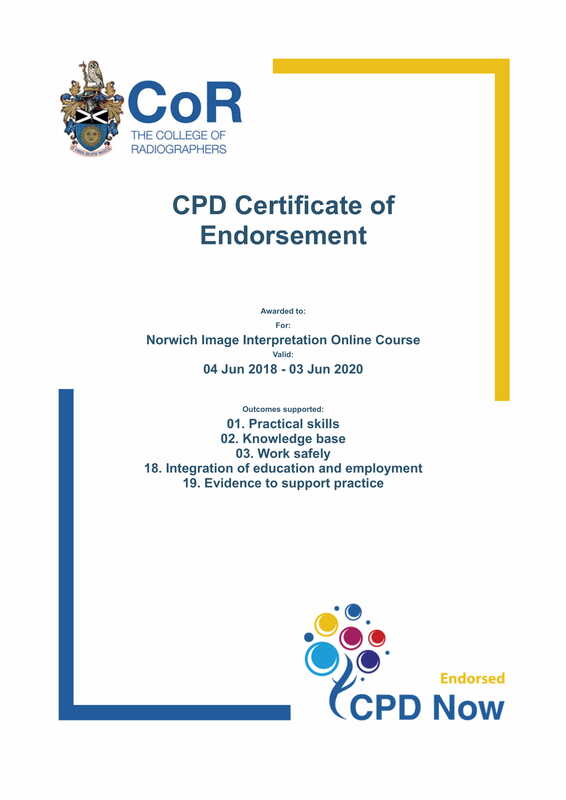 The Norwich Image Interpretation Course is aimed primarily at radiographers who provide a preliminary clinical evaluation (commenting) or "red dot" service to A&E, however it will also benefit those keen to revise their image interpretation skills. Each module covers a particular anatomical area, and both the appendicular and axial skeleton are covered. Relevance to the paediatric skeleton is included in each section. It is anticipated that by reading through each module and referring to the associated images provided, the user will become more accurate in their interpretation skills, so giving a high quality service to clinician and patient. At the end of each module there is an online self-test which is designed to assess the concepts previously taught. There is a facility to log in when taking the self-tests in order to access your own personal score and assess your progress. This score will be updated each time you log on and use the self-test facility. There is no charge for using this, and your details and score will be kept confidential. Once you have scored 95% within each module, you are able to print out a certificate from the website. “Pathology image gallery” - a collection of over 300 images. The pathology image gallery will assist the user in revising their image interpretation skills when viewing pathologies. These pathologies may arise incidentally when looking at trauma radiographs, or may be encountered when reviewing images from GP/rheumatology referrers. Pathologies include arthritides, dysplasias, infections and metabolic disorders, and include both subtle appearances and more advanced disease. The image gallery is in addition to the bone tumours/lytic lesions page with its associated self-test facility. The course has received endorsement by the College of Radiographers, and can be used in your SOR portfolio. We wish to acknowledge the support of the Norfolk & Norwich University Hospital NHS Trust and, in particular, the Norwich Radiology Academy. Most images on the site benefit from the ability to magnify small areas (hover over the image), or to zoom in to view a larger image (click on the image). We would like to thank the creators of MagicZoomPlus for providing us with a free licence to use this fantastic tool! * Please note that the information contained in this website is intended for educational purposes only, and is to be used in conjunction with formal red dot / commenting training. Whilst every attempt is made to ensure the information is correct and up-to-date, we accept no liability for incorrect or out-of-date information. Determination of difficult concepts in the interpretation of musculoskeletal radiographs using a web-based learning/teaching tool. © 2008-2019 Heidi & David Nunn. All rights reserved.